what is the best canned sardines? When looking for the best canned sardines for both health and convenience, we selected the Wild Planet Wild Sardines In Extra Virgin Olive Oil. With the skin included and the scales, tails, and head removed, these sustainably captured sardines are healthy for both you and the environment. They are loaded with health benefits as they are rich in protein, Omega 3, calcium and iron. The price of these canned sardines fits with most budgets. Though they are ready to eat straight from the can, they are versatile enough to use in many of your favorite meals or snacks. Before making a trip to the grocery store or checking out canned sardines online, it is very important that you know that there is more than one option. Sardines are packed with extra ingredients such as oil, water, and hot sauce. For those who are not a fan of the smell or taste of raw fish should choose some packed with oil. Some of the healthiest canned sardines are packed in olive oil. While you can also choose vegetable oil, this is a very fattening option and does not fit in well with any dieting. Choosing canned sardines packed in water are good choices by those who do like the raw fish taste and smell. And for those who like a little kick, those packed in hot sauce are the best choice. You also have a choice in the type of sardines you choose. Some canned sardines consist of one type while others are more of a mix. You might find whole fish, fish fillets, bone in, boneless, with and without skin, without scales, and more. What do you plan to use the sardines for? Are you planning to eat them straight from the can, add them to a sandwich, or use them for gourmet food? The answer to this question will determine the type of sardines you choose. For example, if you want a flavorful snack, you might choose sardines packed with hot sauce. If you want to eat them on a sandwich, the fillets would be a better choice. Determine what all you want to use them for so that you can add the right type to your grocery list. Many canned items come with added salt or other seasonings. While these seasonings can improve the flavor, they are not always best for you. A lot of canned items already contain a large amount of sodium, which is troublesome for those who should be cutting that down. Extra salt can make it worse. Check for added ingredients before purchasing so that you can stay away from those you do not need. Most, if not all, canned sardines add protein, Omega 3, calcium and iron to your diet, but some add more than others. Those that include the skin and bones of the sardines contain more of these vitamins and nutrients than those that do not. Canned and fresh sardines are similar to one another in their nutrient rich benefits. Generally, the healthiest fish to eat are those at the lowest part of the food chain. That is because they have not taken in anywhere near the amount of mercury and other dangerous substances that larger fish or those higher up the food chain take in. As such, sardines are some of the healthiest fish there are whether they are canned or fresh. There are, however, a few differences. Due to being packed with oil, some canned sardines are oiler than the fresh ones, which means they are more fattening. Canned sardines will likely also have higher sodium levels, especially if seasoning or salt is added when they are canned. Canned sardines are also a much lower source of carbs than fresh sardines. Fresh fish is always more expensive than canned fish meaning that canned sardines are much more cost effective than fresh ones, and they last longer. Lastly, they are simpler to eat and find. You do not have to do any preparation in order to eat them unless there are specific things you want to do. Both canned and fresh sardines are healthy options for a diet. In fact, both show that they have equal amounts of Omega 3 to pink salmon, but how do they stack up against tuna, anchovies, and herring? First, sardines have the least amount of mercury in them, according to the Food and Drug Administration. That is because they are so low on the food chain. There are other differences and similarities between these four options, though. Tuna and sardines are similar in the types and amounts of nutrients they add. Both are great sources of protein, Omega 3s, vitamins E and K, calcium, and sodium. The difference comes in the amounts they bring to the table. Tuna provides your body with more vitamin K, which activates the protein you take in, and higher levels of protein. Sardines, on the other hand, provide you with more Omega 3 fatty acids, more vitamin E, which helps improve blood circulation, more calcium, and more sodium. Both of these are great health options. The one you choose to buy will depend on what nutrients you need to add or what you need to stay away from. For instance, if you have high sodium levels, sardines probably are not the best choice. If your blood circulation needs to improve, sardines would be good for you. Ask your doctor which of the two or what type of combination you should choose for your diet. When it comes to sardines and anchovies, the simplest similarities to point out is that they are both small, packed in a similar tin can, and placed side by side in most grocery stores. The similarities go beyond that, however, They contain a long list of similar nutrients which consists of calcium, protein, potassium, iron, riboflavin, Omega 3 fatty acids, vitamin D, and vitamin B12. There are some differences as well. Sardines are a bit larger than anchovies and have a less intense flavor. Anchovies’ curing process turns them darker than sardines and gives them a stronger flavor. While they are both versatile, anchovies are used more in restaurants and recipes than sardines. In fact, I was surprised to find that anchovies are an important part of my beloved Worstershire sauce. Many people think that sardines and herring are different fish when, in fact, this is not actually the case. They are both the same basic fish. When they are smaller, they are referred to as sardines. When they grow larger, they are known as herring and can grow up to 1.5 feet long. Because they are basically the same fish, they have the same benefits. They contain high levels of Omega 3 fatty acids, which are important for brain development and can help with the regulation of inflammation. This means that they are great for people experiencing cramps, arthritis, high cholesterol, diabetes, and more. Additionally, even with herring being a little larger, they are both still at the bottom of the food chain so they contain less mercury and other harmful chemicals. Fish, in general, is extraordinarily healthy for those who consume it, and thanks to sustainable fishing practices, we can eat it regularly. With all of the options out there in both fresh and canned versions, there is an abundance of choices. You may find it most enjoyable and beneficial to eat several kinds of fish or to simply stick with one. As the benefits and nutrients differ in some of these options, it is best to speak with your doctor about what you should add to your diet or take out. This is even more important if you have current health issues, currently do not eat fish, or are changing your diet. To find the best canned sardines, we sifted through buyers’ and experts’ ratings and reviews of loads of brands and flavors. From that long list, we managed to choose these top ten choices to share with you based on their medium, flavor, health benefits, and sustainability practices. What You Will Love: These sardines are lightly smoked to retain the flavor and packed in BPA free cans. 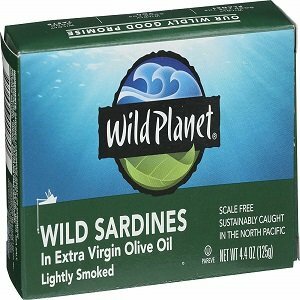 Wild Planet Wild Sardines are sustainably caught and then packed in extra virgin olive oil and sea salt in BPA free cans. The olive oil leaves the sardine with a fresh taste and no smelly odors. The skin remains increasing the amount of calcium and iron you get, but the scales, tails, and heads have been removed. They have been lightly smoked to help keep the flavor in. These sardines are both gluten-free and non-GMO certified as well as Kosher. Just one serving provides you with 18 g of protein and 1800 mg of Omega 3 fatty acids. They are also ready to eat straight from the can. Only two possible downsides were found. One is that the cans are a bit hard to open at times. The other is that these have less calcium than brands with the bones left in. What You Will Love: It has a firm texture but a mild flavor. 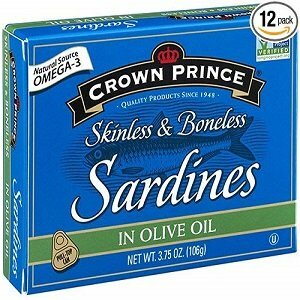 These Crown Prince Skinless & Boneless Sardines are great for those who are just starting to eat fish. That is because many people who are new to fish, and even some that have been eating it for a long time, are not really interested in eating fish with eyes, skin, or bones. I am one of those people. As crazy as it may sound to some, I cannot eat something that looks like it is staring back at me. Also, the idea of eating skin and bones is not too appetizing even with the knowledge that they are good for you. That is what makes these great for new consumers. The bones and skin are removed before it reaches you making it a little easier to swallow, literally. They are hand filleted and hand packed in cold pressed olive oil. The flavor is also not as intense as some other brands making it even easier for newbies. These sardines are Kosher, gluten free, and non-GMO certified. Also, each serving contains 1700 mg of Omega 3 fatty acids. They are also reasonably priced. The only downsides I could locate are that this brand, too, is known as being difficult to open forcing you to use a can opener, and that without the skin and bones, some of the nutrients are missing. 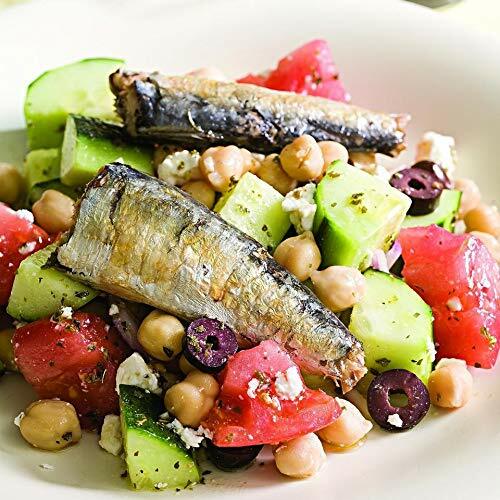 What You Will Love: These sardines are packed in pure olive oil and salt that helps them retain their flavor and gives them a great taste with many meal options. Season’s Skinless and Boneless Sardines are sustainably harvested in and sourced from Morocco. The pure olive oil they are packed in helps them retain their rich flavor. The skin and bones are removed for buyers who do not like them, and the can is made of whole bristling sardines, which are smaller but more nutritional than other sardines. They are packed in BPA free cans and are gluten free and non-GMO. Additionally, Season’s is a brand that has been around long enough to have a good reputation in the industry. Each serving contains 1500 mg of Omega 3 fatty acids, is high in protein and calcium, and low in calories. They are ready to eat straight from the can as they have already been seasoned with salt. The price is reasonable, especially for all of the health and flavor benefits. The only downside I can find is that the flavor does not suit every consumer. Some say it is too intense while others say it is too salty. Most reviews, however, state that the taste is great. What You Will Love: These cans contain two layers of wild caught, wood smoked brisling sardines. Though bristling sardines are smaller than others, they are also more nutritional and, some say, more flavorful. These King Oscar sardines are packed in BPA free cans with extra virgin olive oil and salt. The bones and skin remain for extra calcium and iron. There are tons of Omega 3 fatty acids and protein yet very low mercury levels. These King Oscar sardines are packed in BPA free cans with extra virgin olive oil and salt. The bones and skin remain for extra calcium and iron. There are tons of Omega 3 fatty acids and protein yet very low mercury levels. They are gluten free and great for low carb diets. 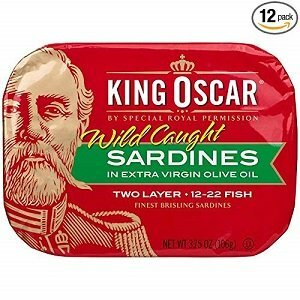 King Oscar sardines are tasty straight from the can because the olive oil helps to minimize the “fishy” flavor while the salt gives them a little extra seasoning. However, they are a bit delicate so it may be somewhat difficult to pick them out of the can. King Oscar’s cans are much easier to open than most others. Additionally, the price is reasonable for most budgets. What You Will Love: They are packed in spring water with no salt added making them great for low sodium diets. 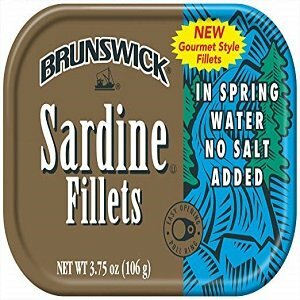 Brunswick Sardine Fillets in Spring Water are sustainably caught and taste like fresh, natural fish. They are a great high-protein snack. One great thing about this brand is that it is tied with Bumblebee brand products, which is a brand that has been around for a long time. It is a reputable company that is known for its eco-friendly practices. 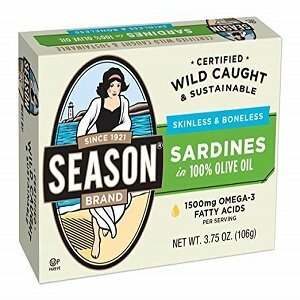 These sardines are great for those on a keto-friendly diet as they are only packed in natural spring water instead of with salt or oil. They are also gluten-free and set at a great price. While these sardines can be used for a variety of snacks and meals, sardine fillets such as these are great for making sandwiches. Their texture and taste give you many options of how to eat them. The one downside is that not everyone will like this flavor. If you do not like the natural taste, you may need to try adding a little salt or another of your favorite seasonings. If you are brand new to the sardine world, you may want to consider another brand until you become more tolerable to the taste of sardines in general. In time, you may find yourself moving to this natural tasting brand. What You Will Love: These whole sardines have the raw flavor of fish for those who want sardines that taste like sardines. Season’s Sardines in water are caught in the wild of Morocco and sustainably harvest. There is no salt added making them a great choice for low sodium diets. Without oil, hot sauce, or seasoning to affect the taste, these sardines provide sardine lovers with the raw, natural flavor that some crave. The skin and bones remain providing extra calcium, and they are full of other vitamins and minerals including 1700 mg of Omega 3 fatty acids. The sardines are packed in BPA free cans, are non-GMO certified and gluten free. Seasons is a loved and trusted brand so you can feel comfortable purchasing their products. Also, the lids are easy to open by simply pulling the tab. They are a great price for a great product. Some people, including those new to eating sardines, may not enjoy the taste. As there is no oil to decrease the smell, the odor might make them difficult to eat. The skin and bones that are left in may be off putting for some. Also, with no seasoning, the taste may be even stronger to some. What You Will Love: These sardines are hand packed to the brim in nothing but water. 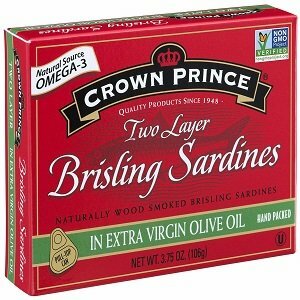 Crown Prince Sardines are another great option packed only in water giving them the natural, raw taste than many sardine connoisseurs enjoy. They are hand packed with no salt added making them excellent for those needing to cut back on their sodium intake. The firm texture makes them simple to lift from the can. These sardines are sustainably caught in the wild of Morocco and are both kosher and non-GMO verified. Though they are packed in only water, the flavor is said to be mild enough for even those new to eating this gourmet food though that will likely still depend on each individual’s taste. And that is one of the only downsides I could find- that they may still be a bit too raw for some. If you try them and find you do not like the taste straight from the can, try seasoning them or try them with a recipe that you do love. Some creativity might lead you to a favorite new food. They are set at a good price for consumers. The other probable downside is that the can is difficult to open without help from a tool. What You Will Love: These spicy sardines go great with Mexican style food such as tacos, nachos and burritos. 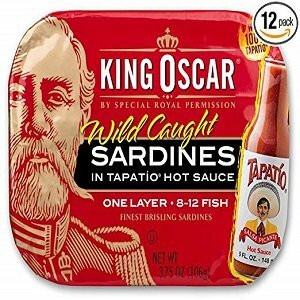 King Oscar Wild Caught Brisling Sardines are oak wood smoked before being dipped in the zesty Tapatio hot sauce to provide a kick in the flavor for those who like it hot. The hot sauce adds some extra flavor to what some might find as a bland or non-enjoyable meal. They have been sustainably caught and packed in Norway for over 100 years. 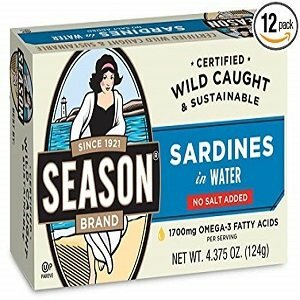 These sardines are gluten free, non-GMO certified, kosher, and low carb foods. 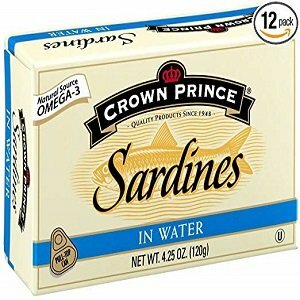 Like all other sardines, they are high in Omega 3 fatty acids, iron, calcium and protein. With no sugar added they are great for weight loss diets. The sardines are packed in BPA free recyclable cans as an even more eco-friendly practice. Those who like hot sauce may find it easier to eat these sardines than those packed in oil or water since the hot sauce can make the flavor of the fish less intense. They are also a great price. There are a couple of downsides. The first is that those that cannot eat hot sauce will not be able to enjoy this flavorful gourmet food. The second is that the hot sauce limits the number of dishes you could easily eat these sardines with. Though I know a few people who may argue with this statement, hot sauce does not taste good on everything- at least not for most of us. Therefore, you would have to stick to certain dishes or get really creative. What You Will Love: These sardines are smoked over hard wood chips before being hand packed with salt and extra virgin olive oil. Crown Prince is a trusted brand that has been around for a long time. These two layer brisling sardines are another great product in a long line of great products. They are sustainably caught and are a product of Scotland. The fact that they are brisling instead of regular sardines adds a great deal of extra nutritional value to them. They are packed full of protein, calcium, and 2g of Omega 3 fatty acids in every serving. Both Kosher and non-GMO verified, these sardines are smoked over hard wood chips to give them a smoky flavor. They are then hand packed with pure, cold pressed extra virgin olive oil and salt to preserve the fish. The olive oil minimizes the “fishy” smell that many sardines have. The salt gives them a little extra flavor. They are a very good price for the benefits and flavor. I did come across a few downsides. First, though these sardines do have a smoky flavor, buyers have commented that the natural flavor of this brand has a smokier taste. If that is what you are after, try the natural version instead. Second, olive oil adds fight while the salt adds sodium. This is either good or bad depending on your diet and health. What You Will Love: These Louisiana hot sauce flavored pilchard sardines have 1.6g of Omega 3 fatty acids per serving. 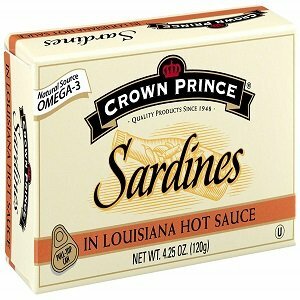 Crown Prince Sardines in Louisiana Hot Sauce are a wild caught product of Morocco. They are kosher and full of nutrients including calcium, protein, iron, and 1.6 grams of Omega 3 fatty acids in every single serving. The hot sauce makes them the perfect flavor for some who like spicy and zesty foods. It can also make any fish taste or odor less intense so new consumers can tolerate sardines. They are set at a very low cost. I found some complaints about the hot sauce itself, however, that may suggest you start by purchasing a small amount to try before buying a large bulk amount. Some buyers said that the hot sauce tasted nothing like Louisiana hot sauce and that it was too oily. Therefore, I went on the hunt for ingredients. The list I found states these ingredients as vinegar, water, chili peppers, salt, soy bean oil, and tomato paste. Of course, as the full recipe of Louisiana hot sauce is proprietary information, we cannot compare them fully side by side, but you can now be aware of what is in the can with the sardines. Perhaps trying to find a can at your local market to try might be better than ordering a bunch online that you cannot return if you do not like them.